Annual (5), or perennial (11). Rhizomes absent (14), or short (2). Stolons absent (13), or present (4). 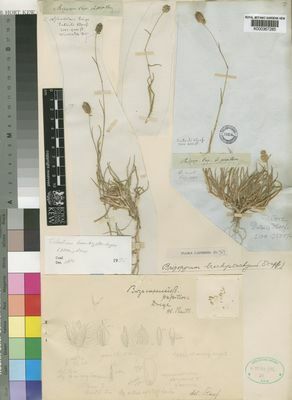 Culms erect (6/11), or geniculately ascending (5/11), or decumbent (5/11); 2-22.43-70 cm long. Ligule a fringe of hairs. Leaf-blades aciculate (1), or filiform (3), or linear (12); herbaceous (15), or coriaceous (1); stiff (2), or firm (13), or flaccid (1). Inflorescence a panicle (12), or composed of racemes (4); not deciduous as a whole (15), or deciduous as a whole (1); subtended by an unspecialized leaf-sheath (15), or an inflated leaf-sheath (1); exserted (9), or embraced at base by subtending leaf (8). Peduncle persistent (15), or disarticulating (1). 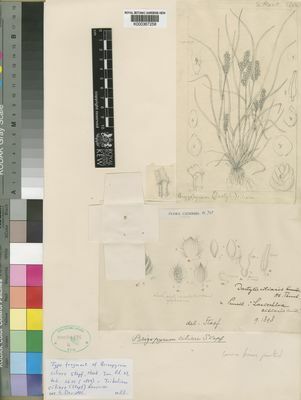 Panicle contracted (3/12), or spiciform (8/12), or capitate (1/12). Racemes single (4/4); linear (3/4), or oblong (1/4); unilateral (4/4). Rhachis angular (3/4), or semiterete (1/4). 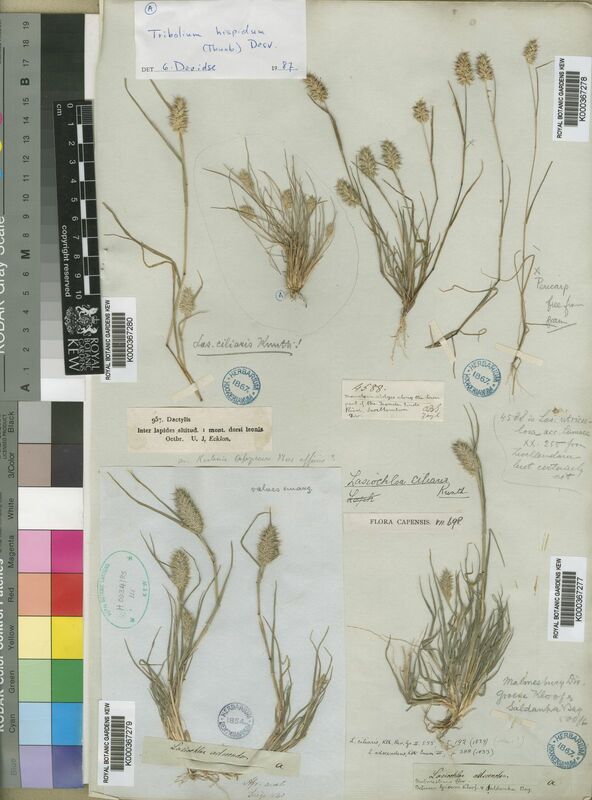 Spikelet packing broadside to rhachis (4/4); crowded (1/4), or contiguous (2/4), or lax (1/4); 2 -rowed (4/4). Spikelets appressed (2/2); solitary. Fertile spikelets sessile (12), or pedicelled (4). 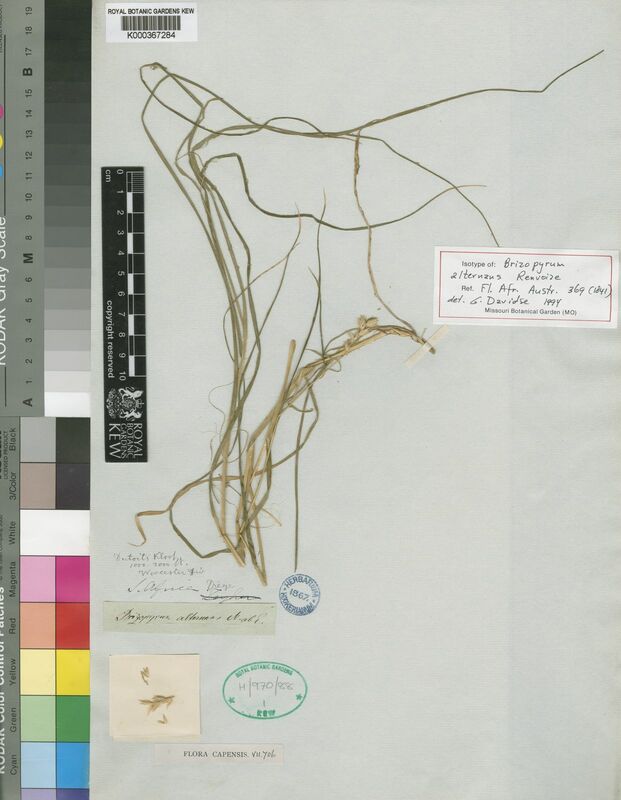 Pedicels linear (1/1). 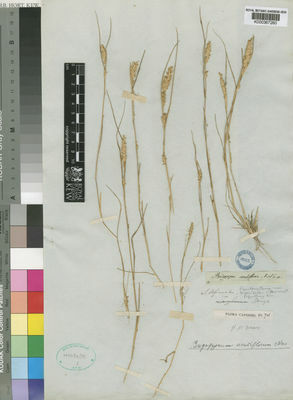 Spikelets comprising 2 fertile florets (6), or 3 fertile florets (11), or 4-5 fertile florets (10), or 6 fertile florets (8), or 7 fertile florets (4), or 8 fertile florets (2), or 9-14 fertile florets (1); with diminished florets at the apex. 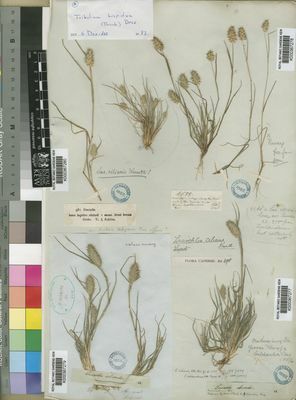 Spikelets oblong (7), or ovate (5), or orbicular (2), or cuneate (3); laterally compressed; 2-4.687-10 mm long; falling entire (1), or breaking up at maturity (15); deciduous with accessory branch structures (1/1); disarticulating below each fertile floret (15/15). Floret callus brief (13), or evident (3); pubescent (1/4), or pilose (3/4). Glumes persistent (15/15); shorter than spikelet (8), or reaching apex of florets (4), or exceeding apex of florets (5); thinner than fertile lemma (3), or similar to fertile lemma in texture (12), or firmer than fertile lemma (1); parallel to lemmas (11), or recurved at apex (1), or gaping (4). Lower glume lanceolate (1), or elliptic (3), or ovate (12); 0.5-0.91-1 length of upper glume; membranous (6), or chartaceous (2), or herbaceous (1), or coriaceous (7); without keels (4), or 1-keeled (12); 3 -veined (3), or 5 -veined (13), or 6-7 -veined (1). Lower glume lateral veins without ribs (15), or ribbed (1). Lower glume surface glabrous (8), or pilose (4), or setose (4). Lower glume apex acute (10), or acuminate (7), or attenuate (1), or setaceously attenuate (2); muticous (15), or awned (1). 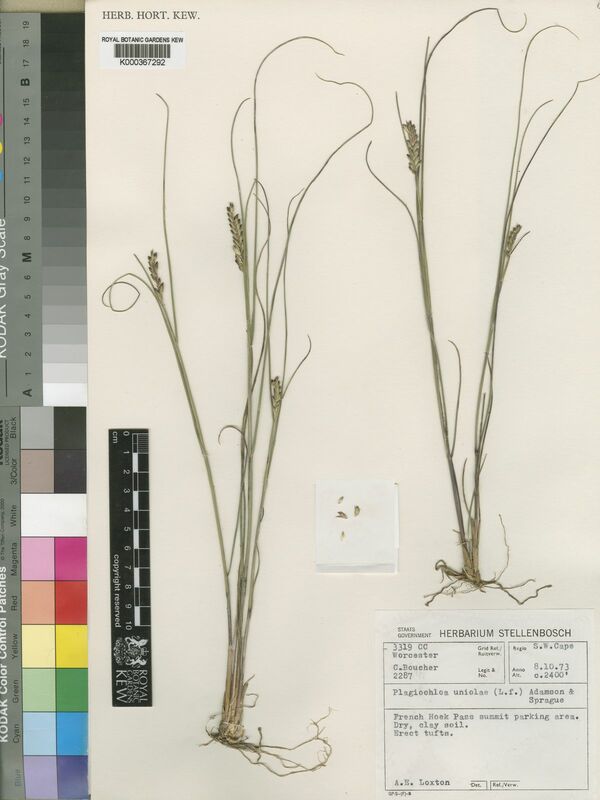 Upper glume lanceolate (1), or elliptic (3), or ovate (12); 0.8-1.262-3 length of adjacent fertile lemma; membranous (7), or herbaceous (1), or coriaceous (8); with undifferentiated margins (15), or hyaline margins (1); without keels (4), or 1-keeled (12); 3 -veined (2), or 5 -veined (14), or 6-7 -veined (1). Upper glume lateral veins without ribs (13), or ribbed (3). Upper glume surface glabrous (8), or pilose (4), or setose (4); with tubercle-based hairs (8/8). Upper glume apex acute (9), or acuminate (6), or attenuate (1), or setaceously attenuate (3); muticous (15), or awned (1). Fertile lemma elliptic (1), or oblong (4), or ovate (11); membranous (6), or chartaceous (3), or coriaceous (7); of similar consistency above (15), or much thinner above (1); of similar consistency on margins (11), or much thinner on margins (5); without keel; 5 -veined (1), or 7 -veined (11), or 8 -veined (2), or 9 -veined (6). Lemma midvein eciliate, or ciliate (2). Lemma lateral veins prominent (1/1). Lemma surface glabrous (9), or pubescent (5), or pilose (2); with simple hairs (2/7), or capitate hairs (1/7), or clavate hairs (4/7); without hair tufts (12), or with marginal hair tufts (2), or with a transverse row of hair tufts (2), or with 2 transverse rows of hair tufts (1). Lemma margins eciliate (8), or ciliate (7), or setose (1). Lemma apex entire (12), or dentate (1), or lobed (3); 2 -fid (4/4); incised 0.5 of lemma length; obtuse (6/14), or acute (7/14), or acuminate (1/14); muticous (11), or awned (5); 1 -awned (4/5), or 3 -awned (1/5). Principal lemma awn apical (1/5), or from a sinus (4/5); straight (1/5), or curved (1/5), or geniculate (3/5). Palea 1 length of lemma; 2 -veined (13/13). Palea keels wingless (13), or winged (3); smooth (14), or scaberulous (2); eciliate (10), or ciliolate (6). Palea surface glabrous (10), or pubescent (4), or pilose (2). Apical sterile florets resembling fertile though underdeveloped. Lodicules 2 (9/9); fleshy (9/9); glabrous (5/9), or ciliate (5/9); truncate (1/1). Anthers 3 (4/4). Ovary glabrous (1/1). Caryopsis with adherent pericarp (4/15), or tardily free pericarp (11/15); obovoid (2/2); concavo-convex (2/2). Embryo 0.33-0.415-0.5 length of caryopsis. Hilum elliptic (1/2), or linear (1/2); 0.25 length of caryopsis.